Back in May we stepped up in the world! We loved our first home together, it was a great location for school and a great “starter” home but it was NOT in a good neighborhood AT ALL! We both knew we wanted to start a family soon and thought it was time to move to the next-step-up home. 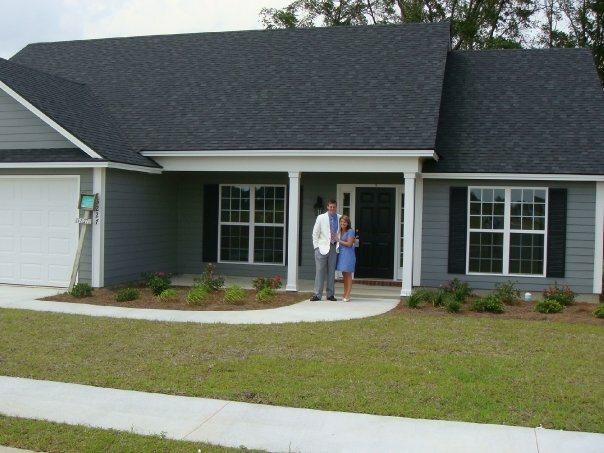 We found a great house in a new, SAFE, neighborhood called Grove Pointe and moved in! We have spent the last 3 months making the house into our home. We painted almost every room, Zach built a fence and a storage shed, and we bought all new furniture and everything! Finally it is finished!!! So we invited the whole church as well as our close friends and family to stop by on Saturday to see our home 🙂 I spent a ton on food and sooo much time getting the whole place ready to be shown. My feet and legs hurt so badly from all the work and of course the day of it was total DOWNPOUR outside. We still had an okay turn out considering the weather (30 or so people) and it really meant a lot that those people came since they had a perfectly good excuse for not coming! It was a fun afternoon but we will be eating pigs-in-a-blanket and meatballs for the rest of our lives with all the leftovers we have!!! Zach with the over 150 pigs-in-a-blanket we have left!!! Mom sent us these funny shirts for the baby! So cute and I already put them with the onesie I got Zach for his birthday! Not many clothes yet but I’m sure it won’t stay that way for long!!! Previous Post Rain Rain GO AWAY! Next Post A Baby Bump! Yay! It tuned out great Em all your hard work paided off!!! !